Are you refraining yourself from ice cream, cold drinks, cold air in the mornings when you breathe through your mouth causing a jolt to your teeth and forcing you to stay indoors? Even biting on a candy is causingpressure to your tooth? The answer is simple, you are suffering from sensitive teeth. Wondering how did all this happen? It could be due to various reasons from decay to gum disease. What causes teeth to be sensitive to cold? i. Tooth decay – a grossly decayed tooth where the enamel layer is eaten away and reaches the dentine, the dentinal tubules gets exposed. It’s a semi-porous substructure with movement of fluid in them causing a mild and dull pain upon consuming cold drinks. surface. You could suffer from sensitivity to cold as the root surface is sensitive in nature when the protective gum tissue is lost over time. temperature within the tooth nerve ends up in a twinge in the tooth. hardens into tartar, the bacteria present are responsible for gingivitis and periodontitis that cause gum recession. The open tubules in the tooth that leaves nerves vulnerable to cold sensations. v. Cracked tooth – when tooth is fractured or chipped there will be an access present for bacteria from plaque which can aggravate an already irritated pulp within the tooth thus worsening the sensitivity. to place an amalgam filling with an underlying layer of calcium hydroxide lining the seal the exposed dentine. 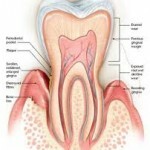 One may initially feel the sensitivity even after this treatment till the reparative dentine bridge is formed. It may also occur after scaling and root planing but it is temporary in nature. subsequent receding gum line and root sensitivity. extra strain and wear on the tooth surfaces. As a result, the microscopic dentinal tubules are exposed making them more sensitive as you eat or drink. ix. Chewing tobacco or “snuff” which is a common practice among certain groups and preferred compared to cigarette is a major cause of gum disease and tooth sensitivity. x. Tooth whitening products containing peroxide and baking soda are known to be major contributors of sensitive teeth especially for regular users. 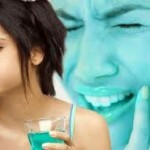 How to overcome tooth sensitivity? or a crown can be given in cases of cracked tooth. measure is sensitivity arises due to bruxism. It may help to control the habit and reduce the amount of wear on teeth thus slowing the rate of increasing sensitivity. fluorides or potassium nitrate which occlude the dentinal tubules protecting against sensitivity. recommended for those with severe tooth decay problems. Dentist may also apply “bonding agent” to close the pores in the tooth root in order to decrease the sensitivity. Remember to get your routine dental check-up every 6 monthsto ensure your teeth and gums are healthy.